Recently, I had the opportunity to write a guest blog post for Electronic Health Reporter about what to expect at HIMSS16. For the post, I reviewed the titles and categories of the educational sessions to see what the popular themes are for this year’s conference and matched them to last year's topics and categories to identify trends (Figure 1). 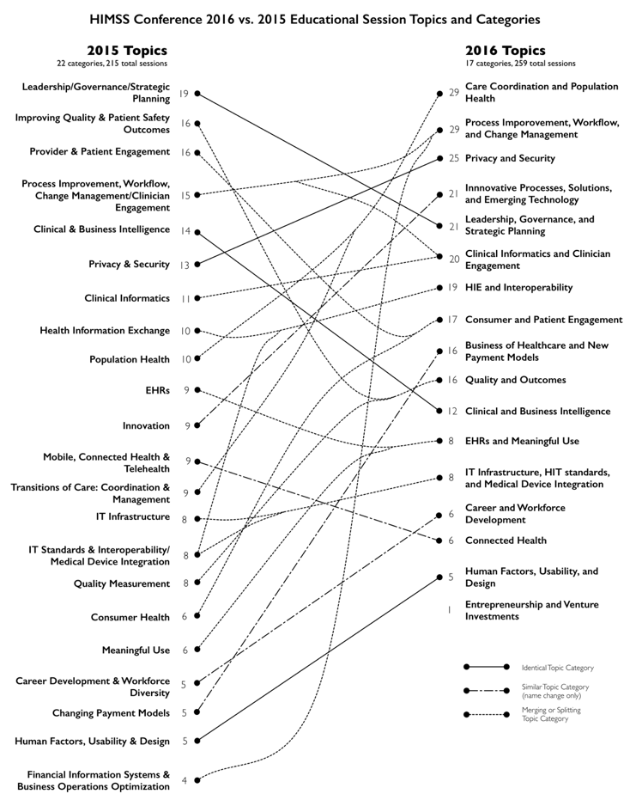 While it wasn’t my focus for the Electronic Health Reporter blog, I did notice a number of places where the HIMSS trends overlap with my 2016 consensus predictions for Health IT. The HIMSS Conference and Exhibition is always a good barometer of the healthcare industry’s current state and direction, but this year will be particularly interesting because of the major changes underway in healthcare. Figure 1. To get started, I created a visualization of the data in order to see how the educational session categories are trending and morphing over time to identify the top session categories and topics. Medical records and related data have reached the point where most information is stored electronically, and we are increasingly able to share and reuse data. However, the significantly higher risk of the data falling into the wrong hands is an unwanted side effect of electronic, portable data. The number of educational sessions about privacy and security doubled this year compared to last year, reflecting the industry's focus on reversing the trend of increasingly serious data breaches and a reaction to new federal regulation. Aligned with prediction #4, we should expect to see new technologies and sharing of best practices at HIMSS this year. Interoperability no longer refers to connecting systems within a single hospital. The new challenge is to move data among different institutions, and this is reflected in the fact that the Health Information Exchange and Interoperability categories from 2015 are combined this year. When exchanging data among organizations becomes as common as integration within institutions, effective care coordination will be possible (prediction #5). HIMSS attendees should expect to see case studies of successful cross-organization data sharing and updates on interoperability standards. Electronic Health Records (EHRs) will always be a key piece of an institution’s infrastructure because they contain the official, legal records of patient encounters. EMRs are optimized for documenting and generating billing codes for episodes of care. But as healthcare delivery and reimbursement moves to a model that requires continuity of care across different settings, new, community-wide tools will be required, as I indicated in prediction #10. The EHR’s decline in prominence coupled with the fact that meaningful use (MU) is winding down, accounts for the fact that the EMR and MU category has only about half the number of educational sessions as last year. The 2016 prediction about mobile apps, wearables, and the Internet of Things (prediction #7) is included in the Innovation and Emerging Technologies category, which contains more than twice as many sessions as 2015. The Entrepreneurship and Venture Investing category is new for 2016. These two categories demonstrate the fact that we are experiencing a significant shift in the healthcare industry, which is proving to be a fertile environment for innovation and new opportunities. HIMSS16 will be an interesting checkpoint to see if the consensus predictions remain on track for this year.